By blaming "this very offensive video," Obama and his lackey Rice are trying to get Americans to look the other way. They don't want people to see that Obama's embassy security policies enabled the attackers to invade our embassies and kill staff members. Jimmy Carter - Iran 1979. Obama - Egypt and Libya 2012. Two losers who deserve their place on the list of presidential failures. (ABC News) -- U.S. Ambassador to the United Nations Susan Rice said the attack on the American consulate in Benghazi was not premeditated, directly contradicting top Libyan officials who say the attack was planned in advance. 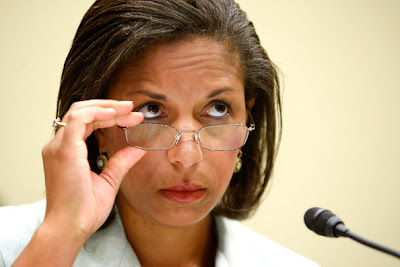 "Our current best assessment, based on the information that we have at present, is that, in fact, what this began as, it was a spontaneous - not a premeditated - response to what had transpired in Cairo," Rice told me this morning on "This Week." "In Cairo, as you know, a few hours earlier, there was a violent protest that was undertaken in reaction to this very offensive video that was disseminated," Rice said, referring to protests in Egypt Tuesday over a film that depicts the Prophet Muhammad as a fraud. Protesters in Cairo breached the walls of the U.S. American Embassy, tearing apart an American flag. "We believe that folks in Benghazi, a small number of people came to the embassy to - or to the consulate, rather, to replicate the sort of challenge that was posed in Cairo," Rice said. "And then as that unfolded, it seems to have been hijacked, let us say, by some individual clusters of extremists who came with heavier weapons… And it then evolved from there." Great New Romney Ad: "Dear Daughter"